Climb from Como Lake: The jeep road continues well above Lake Como to some small lakes called Blue Lakes. (Very rough, few motorized vehicles can survive it.) As you hike up the valley, Ellingwood Point is dominating the view, a nicely shaped, pointed peak. 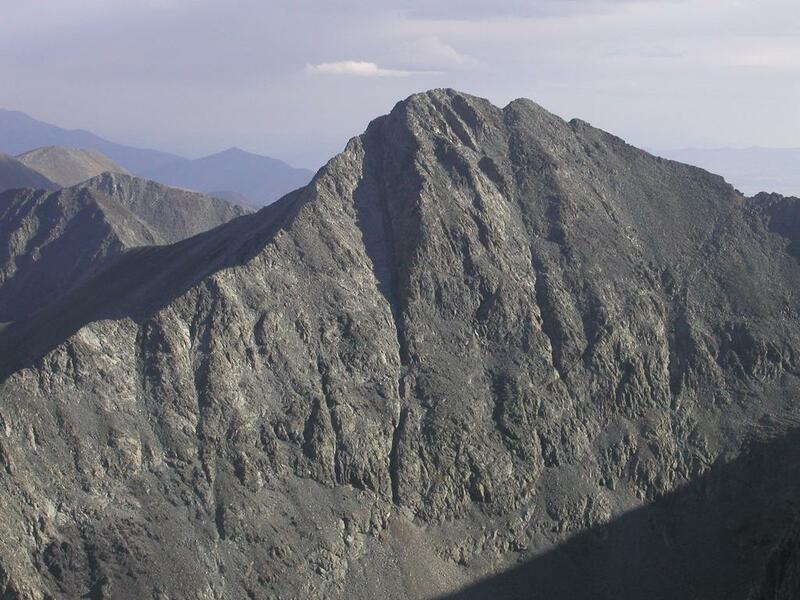 Little Bear Peak is towering on the right hand side, while Blanca Peak is partly hidden as part of the ridge connecting it to Little Bear. The road ends just in front of a steeper "step" in the valley. At this point, the trail continues with a sharp turn left across a small meadow then climbing the left side of the valley in gentle zig-zag turns. After this uphill, the terrain again is more gentle as one pass Crater Lake with Ellingwood Point towering on the left side. Continue along the very nice Blanca trail until you are directly below a very distinct, narrow gully that extends up slightly left of the Ellingwood summit. 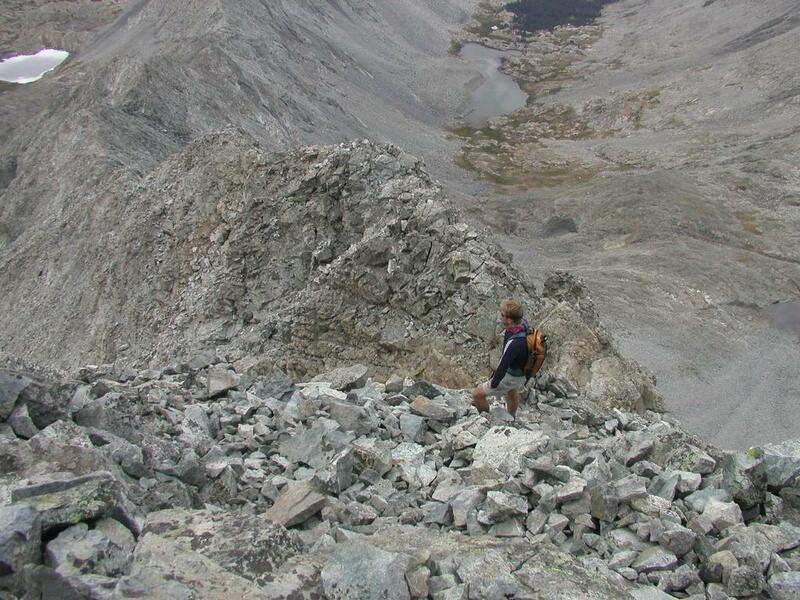 There is a field of talus between the gully and the Blanca trail. This point was marked with a wooden pole when we climbed, however this marker may not be there next time. 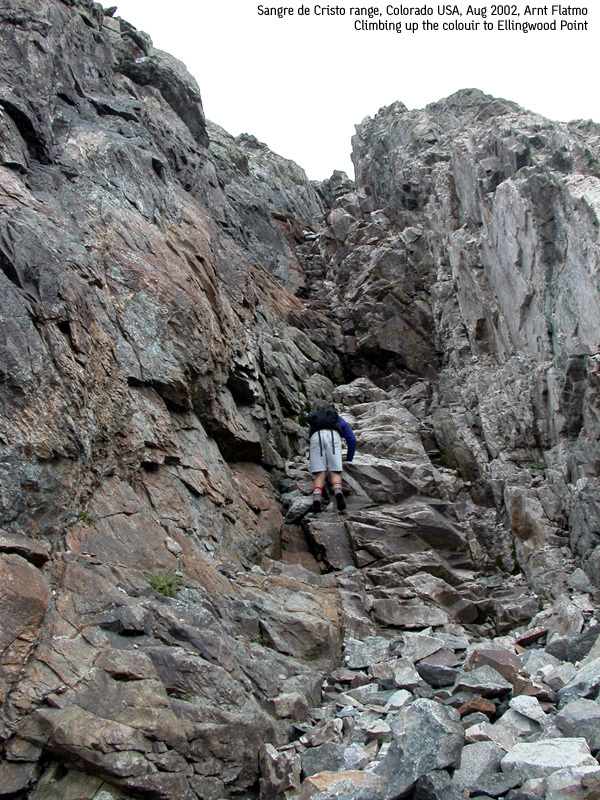 Ascend through the rocks and find the deeply inset entrance to the narrow gully. At the lower end, this gully is very narrow with quite solid rocks. Climb directly up inside the gully, this is fun scrambling YDS class 3. As you ascend higher, the slope eases and the continued climb is class 2. This part of the gully has more loose rocks, ascending along one of the sides is still quite easy. Continue until the gully tops out at the southwest ridge of Ellingwood quite close to the summit. Follow the southwest ridge a short distance to the summit, this part is easy class 3 scrambling on good rock. Descend the standard route down talus and scree into the bowl below the Ellingwood-Blanca ridge and find the very distinct Blanca trail. Comments: I did this climb with Arnt Flatmo. The climb took about two hours from Como Lake to the summit. This route (described above) is not described in the common guide books. The route should only be climbed by a single party at a time, and even then one must pay full attention to the the potential danger that rocks may come down this very narrow path. Wear a climbing helmet and consider the conditions before launching. 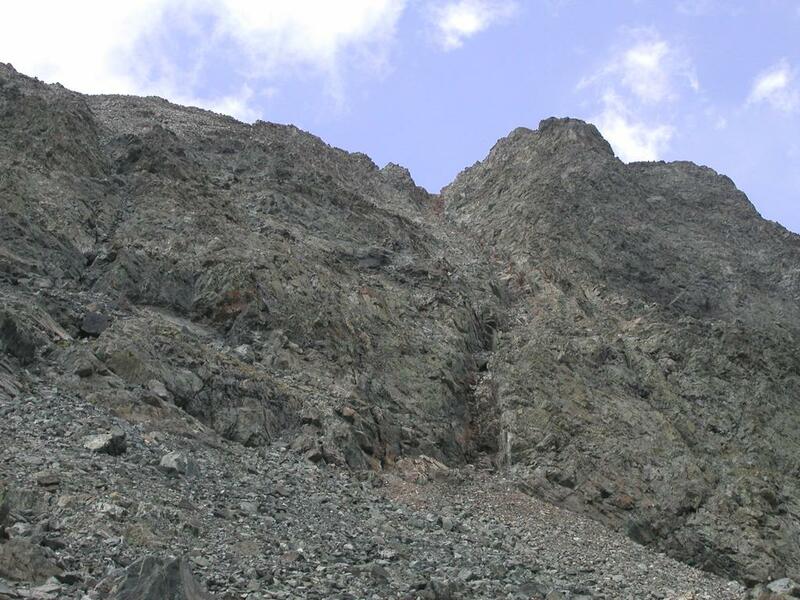 The "normal route" on Ellingwood follows the Blanca Peak route all the way to the slope below the Blanca-Ellingwood ridge, then turns left up talus and scree slopes staying well below the connecting ridge. This route is YDS class 2. Ellingwood Point, as seen from Little Bear Peak. Our route of ascent followed the distinct couloir just left of the summit. The lower part of the couloir that we ascended on Ellingwood Point. Climbing in the lower part of the couloir. Arnt on the south-west ridge of Ellingwood Point. The couloir described above tops out on the ridge just below, one can see the couloir coming up from the left.